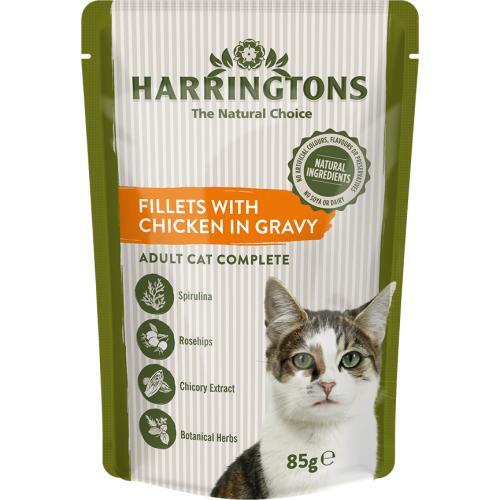 Harringtons wet cat fillets are a complete pet food providing balanced nutrition for adult cats. We have created these tasty meals to delight your cat and provide a healthy diet. Natural healthy ingredients with added vitamins and minerals. With Spirulina which is rich in protein and omega 3 known to help promote a supple skin and lustrous coat, Rosehip a rich source of vitamin C, Botanical herbs including Oregano, Parsley and Sage and Chicory Extract which is known to help support digestive health. With no added soya, no diary and no artificial colours or flavours.